The head of the Chicago Teachers Union will be in Austin next week talking about education and other issues facing the city as she tests the waters for a potential mayoral run. CTU President Karen Lewis has been visiting neighborhoods across Chicago as she explores whether to challenge Mayor Rahm Emanuel in the February 2015 election. Lewis will speak from 6 to 8 p.m. Thursday, Oct. 9 at Destiny Worship Center, 5510 W. Chicago Ave. The “listening and talking tour” began in August and has included stops in Beverly, Little Village and South Shore. Others already in the race include Ald. Bob Fioretti (2nd), former Ald. Robert Shaw and Amara Enyia, executive director of the Austin Chamber of Commerce. Eight of the 14 candidates running for mayor Feb. 26th participated in last week's forum, which was organized by the Chicago Westside chapter of the NAACP. 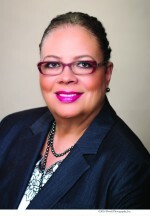 Chicago Teachers Union President Karen Lewis announced the tentative contract agreement late Monday night.